This is the second version of one cool war game in which you will have to lead your troops into battle and be quick with your actions if you want to take your enemies by surprise. The goal here is to select your units and tell each individual what to do. They can gather ore and farm for you in order to allow you to build more units and more buildings. You will encounter lots of other enemies that need to be killed and it is recommended that you send your most skilled to take care of them. 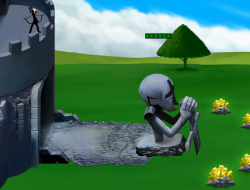 Units can regenerate as they pray to their god in front of the castle. Stick War 2 0.00 between 0 and 10 based on 0 votes.